When you think of Nashville, you probably think of the Grand Ole Opry. But this up-and-coming city has a lot more going for it than country music. Think fusion BBQ, whiskey and craft beer distilleries, trendy shopping, rock and indie music venues, and off-the-charts affordability compared to other U.S. destinations. Need a reason to visit the Music City? Here are 11 of them. Nashville is home to some of America’s best BBQ, live music, and creativity. With 94 people on average moving to the area every day, it’s one of the nation’s up-and-coming millennial hubs with lots to offer to visitors. While Nashville’s reputation lends itself to cowboy hats and songs about trucks, the opposite could not be truer. Music legends like Paul McCarthy and Bob Dylan have both recorded songs and albums in the city. Rock and roll famed Kings of Leon call Nashville home as well as other artists like The Black Keys and Jack White. Currently, at the Country Music Hall of Fame and Museum, you can find the exhibit, Dylan, Cash and the Nashville Cats that chronicles Bob Dylan’s recording career in Nashville and partnership with Johnny Cash. This isn’t to say country music doesn’t fuel the sound of Nashville. With many of the genre’s major recording labels in the city, as well as the Grand Ole Opry and historic Ryman Auditorium, country music is still a major part of Nashville’s culture. With the world’s top-selling whiskey’s distillery (Jack Daniel) about 1.5 hours outside of Nashville, distilling is a huge part of Tennessee’s culture. While the Jack Daniel Distillery is well worth a visit, so are some of the up-and-coming craft distilleries located downtown. Nelson’s Green Brier Distillery in Marathon Village does distillery tours every half hour seven days a week for $10 and has an awesome gift shop. The distillery, which was originally operational before prohibition, was recently rediscovered and reopened by Charles Nelson’s great-great-great-grandsons. Just right down the street in Marathon Village is Corsair Distillery, a trendy space with a taproom (they also brew beer), courtyard, and tasting room. The brew-distillery produces everything from a traditional artisan gin to experimental spirits like an elderflower bohemian malt whiskey. Tours are offered every hour over the weekend and limited times on Tuesdays and Fridays and cost $8 with a tasting. The distillery also recently opened a second location in Wedgewood Houston area that also offers tours. With strong roots in country music and the American South, Nashville has a rich history that can be seen through the city’s architecture, museums, food, and music. Davy Crockett, one of Nashville’s Congressmen, was known for his stories and fiddle playing, making music one of the founded characteristics in the 1700s. Buildings like the Ryman Auditorium, which hosted the Grand Ole Opry (until it moved to Opryland) is known as the “Carnegie Hall of the South.” And the city even has its own Parthenon that is a full-scale replica of the Greek landmark located in Centennial Park, originally built for Tennessee’s 1897 Centennial Exposition. Other historical landmarks like the Belmont Mansion, Cheekwood Botanical Gardens & Art Museum, and Belle Meade Plantation tell the story of Southern culture during the 1800s and early 1900s and now offer themselves as museums and event venues. Nashville has some of the South’s best food, from Indian-Southern food to traditional West Tennessee BBQ, the options won’t disappoint. Not only does Nashville do great meals, their coffee culture is up-and-coming as well with concept brands Bongo Java, Frothy Monkey, and CREMA. They’ve also got a mean brunch and food truck scene that’s worth indulging in. Read our guide to the best restaurants Music City has to offer. While recent years have lent themselves to some snow and cooler winters, Nashville has a very mild fall and winter compared to other parts of the country with temperatures staying well above 40 degrees during the day. Summertime is often on the hotter side with the average summer temperature reaching its peak at 88 degrees in July. We recommend going in March, April, May, and October for a mild climate and to avoid the city in the summer months if you don’t like the heat. 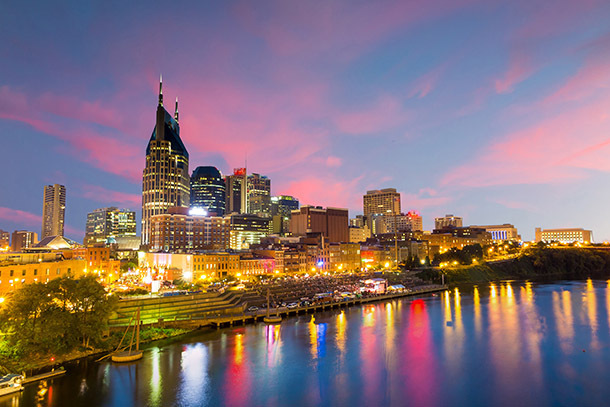 Much like any up-and-coming city, Nashville has quite a few trendy areas that are attracting tourists and locals alike for their food, shopping, cafes, and galleries. While Downtown’s Broadway Street is always happening The Gulch, Germantown, 12South, Marathon Village, and Hillsboro Village can be just as exciting and are worth a visit. In addition to Nashville’s traditional art museums at the Parthenon, Belle Meade Plantation, Belmont Mansion, and Cheekwood, the city has a non-collecting museum in the city’s historic U.S. Post Office Building-Frist Center for the Visual Arts. The Frist Center has hosted exhibits with works from Frank Lloyd Wright to Michelangelo. The city also has numerous music museums and tours starting with the Country Music Hall of Fame and Museum, as well as the Johnny Cash Museum. See where Elvis recorded the majority of his songs at RCA Studio B, and watch how a vinyl record is made at United Record Pressing. Nashville is emerging as one of the nation’s leading craft brewery cities too. Many restaurants now have numerous local beers on tap, and since 2010 more than 12 new craft breweries have opened up shop. Yazoo Brewing Company was one of the first on the scene in the early 2000s and is popular for its Embrace the Funk series of tart and sour beers. Yazoo offers tours at 5:00 and 6:00 p.m. on Wednesdays and Fridays and then every half hour on Saturdays between 12:00 and 5:00 p.m. and cost $8. While newer to the scene, Tennessee Brew Works is growing fast with its locally known Basil Ryeman beer (which uses Thai basil) and Country Roots (sweet potato stout). Stop by the brewery’s restaurant and catch some live music or take a tour for $7 on Saturdays at 3:00, 4:00 or 5:00 p.m.
Other breweries worth a mention: Black Abbey Brewing Company to try the POTUS 44, a coffee stout and Jackalope Brewing Company for their experimental concoctions. From music to publishing to performance art, Nashville is perhaps one of the most creative cities growing in the country. With so many people moving to the city each day, the creativity will only grow as its population does. If you’re looking for some non-music or non-traditional offerings check out Hatch Show Print, the company which designs and prints posters for all the shows at the Ryman. The studio does tours for $15 and lets you make your own letterpress print. OZ Arts is also a great creative alternative to the more traditional art venues in the city. It’s a newly converted gallery and performance space that was once the headquarters for a major cigar company. The space hosts a variety of creative performances and shows, often only one or two days long, so check their website for events when you’re visiting. On most Thursdays, they host TNT (Thursday Night Things), which showcases local artists in a casual manner as opposed to their traditional visiting artist programs. From Broadway’s honky tonks to intimate songwriting circles, there’s no doubt that this is Nashville’s most loved quality. No matter what kind of genre of music you like, you’ll be sure to find at least one live performance during your visit. For modern-day country fans, we recommend hitting up Tootsie’s Orchid Lounge, Robert’s Western World, or Legends Corner. If you want a more intimate experience, reserve a seat at the Bluebird Cafe, or if that is too cliché after watching the show Nashville, check out the Station Inn for some bluegrass jam sessions. You can also book a seat at Sirius XM’s “Heroes Behind the Hits” recording session and listen to some country music songwriting legends. If country music isn’t your thing, Exit/In, The End, The 5 Spot, and The Basement all offer rock and indie bands, and you can catch larger touring bands at The Mercy Lounge. When comparing to most major U.S. cities, the cost of living in Nashville for tourists and locals is relatively low. Parking, gas, food and drink prices, and admission prices are all on the lower end, however; year over year growth shows prices are increasing due to both the growing population and number of tourists the city has seen. Even so, low costs once you arrive are still a major benefit when comparing it to most major U.S. destinations. Ashley Rossi traveled to Nashville courtesy of Nashville Convention & Visitors Corp. Follow all of her adventures (big and small) on Instagram and Twitter.